Threads of Green Fabrics Store is located on the outskirts of Kilkenny City in the southeast of Ireland and we offer a worldwide fabric mail order service. Everybody who visits us has a story and it is our pleasure to contribute a little to the thread of that story everyday: lace for a beautiful bride, net for a little girl’s tutu, a patch for a schoolboy’s trousers, warm tweed for a skirt for Gran, cottons for Baby’s quilt, trims for a young upcycler (who will be a famous designer someday!) and so it goes, and this is what we love…. Whether you visit us in store, talk to us on the phone or contact us online, you will be looked after by either Norma or Miriam. With many (many!) years of experience in bridal and dance costume design and manufacture behind us, we are here to give friendly assistance and guidance to you in all your fabric and haberdashery choices. 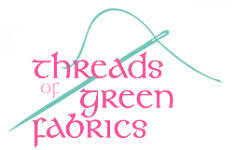 Threads of Green Fabrics is a trade name of Threads of Green Dancewear Ltd. Established in 1985, Threads of Green Dancewear Ltd was a premier supplier of Irish dance costumes and dance fabrics worldwide, for twenty years, until August 2005. In 2005, our fabric range was extended from dance fabrics only to include dress and craft fabrics, drawn from collections all over the world.